A triathlete makes the biking turn during the Greater Cleveland Youth Triathlon. 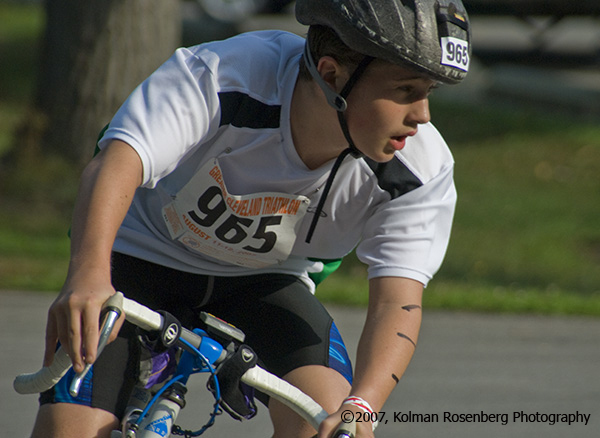 While shooting the swimming, running and biking of the Greater Cleveland Youth Triathlon in 2007, I searched for an interesting shooting position during the biking portion of the event. I found a hairpin turn on the biking course which allowed me to shoot the bikers while they were coming toward me, turning, and moving away from me. This photo stood out as it shows the biker glancing ahead while making the turn. From this point in the course he could see the riders ahead of him and behind him at the same time. I suppose you could say he felt the same way about this spot in the course as I did! This entry was posted in Uncategorized and tagged bicycle, bike, Cleveland, course, triathlete, triathlon, youth. Bookmark the permalink.